CamPermanent - Is the ultimate solution for all of your video demands. It supports Webcams, Netcams (IP-Cams) (still picture & motion-JPEG & MPEG4-mode) and all video devices which are working with an up to date driver for Windows. The permanent record functionality makes your PC to a digital security center. Record from all connected cameras permanent 24 hours 7 days a week. Each video could be adjusted in size or record length. Additional there is a network server client functionality to send the video from all cameras from one server PC to all connected client PCs. The number of cameras is not restricted. For professional and privat surveillance purposes there is a built-in motion detector which has numerous functions. You could select which areas of the video are tested for motion, in which time range, on which days, in which intervals etc. The functions which are started at detection are: video recording, picture capturing, external program execution, sound playing, FTP transfer, email sending and more! Additional there is a scheduler working for all further video demands. The scheduler works in all selectable time ranges and intervals, with so many functions, that every demand is fulfilled. All cameras and all functions are working simultaneous! 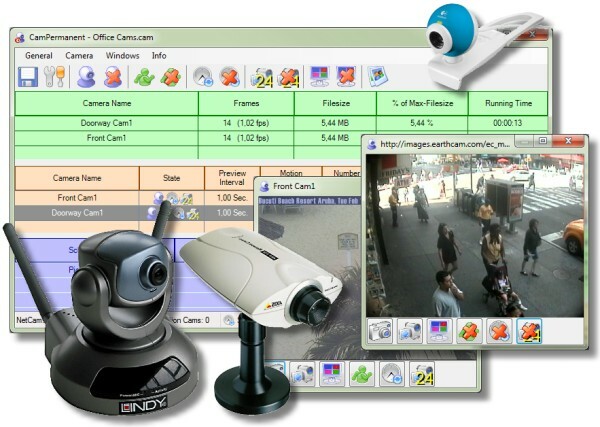 Easily could the video picture of all cameras be uploaded to a webpage, or all Netcams within a company's LAN could work as a surveillance system with permanent video recording and viewing parallel. For example you can generate for each day a new record which contains the whole day! Addtional CamUniversal has an integrated webserver! So you could easily view all cameras live by simple HTTP request in your webpage. The webserver makes it possible to control the program from remote. The integrated media viewer and the external player completes the package! Multiple languages are supported (english, german, spain, french, italian, turkish, danish, polski, chinese).